A striking, intenselooking man with a face that wouldn't look out of place on Mount Rushmore, Duvall is one of the most gifted actors to grace the screen. Despite his commanding presence, Duvall doesn't enjoy the star status shared by many of his contemporaries. In his 30-year movie career he has deftly mixed lead roles with character portrayals, and while many of his films have been less than perfect, few would claim that he has given a bad performance in any of them. Working in stock and offBroadway in the late 1950s and early 1960s, he also appeared on TV before making his film debut as the retarded Boo Radley in To Kill a Mockingbird (1962). Although his tight-lipped, taciturn manner suggested him for heavy parts, he has displayed wide range in a diverse array of roles, including two for burgeoning director Robert Altman:Countdown (1968) and MASH (1970, as Frank Burns). Duvall's solid, assured performance in The Rain People (1969) marked the beginning of a lengthy association with director Francis Ford Coppola, for whom he played cool Mafia mouthpiece Tom Hagen in both The Godfather (1972, earning an Oscar nomination) and The Godfather, Part II (1974), and a crazed colonel ("I love the smell of napalm in the morning...") in the Vietnam-based epic Apocalypse Now (1979, getting another Oscar nod). Other memorable roles include that of a TV executive in Network (1976) and a domineering father in The Great Santini (1979, which got him a Best Actor Oscar nomination). Many critics felt that Duvall's finest part was that of a washed-up country singer in Tender Mercies (1983, for which he wrote and performed his own songs); members of the Motion Picture Academy agreed, and finally voted him a Best Actor Oscar for his performance. In recent years he has costarred with Robert Redford in The Natural (1984), with Sean Penn in Colors (1988, as a streetwise L.A. cop), with Natasha Richardson and Faye Dunaway in The Handmaid's Tale (1990), and with Tom Cruise in Days of Thunder (1990). He was especially memorable as the dour but kindhearted Southern patriarch in Rambling Rose (1991), as a nasty newspaper publisher inNewsies (1992), and as a middle-aged, highly intuitive L.A. police detective in Falling Down (1993). Other recent credits include The Plague (1992), Geronimo, Wrestling Ernest Hemingway (both 1993), The Paper(1994), and The Scarlet Letter (1995). Throughout his career he has opted for interesting parts, not blockbuster hits, and his filmography is dotted with good "little" films like Tomorrow (1972) and The Stone Boy (1984). In recent years he found two of his best opportunities in TV miniseries: the outstanding Western saga "Lonesome Dove" (1989), in which he played a salty former Texas Ranger, and Stalin (1992) in which he took the title role, under an elaborate makeup. 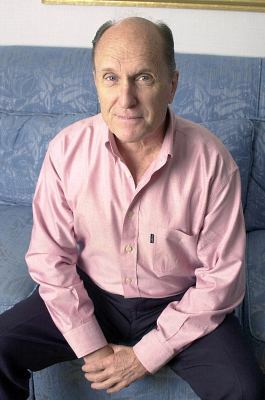 Duvall has directed two movies, We're Not the Jet Set (1974) and Angelo, My Love (1983).